Uber can save you a lot of money when using their independent taxi service to get around. But you may not have known that Uber can also give you credits for free rides, just for referring Uber to your friends and family. 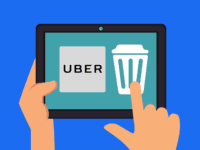 In this article, we’ll break down how this referral process works, and explain other ways of getting free rides with Uber, so you can start saving even more by using Uber! 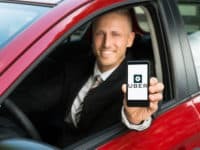 Looking for a more detailed explanation or more ways to get free rides with Uber? Check out our step-by-step instructions below on how you can get free Uber rides and Uber discounts. 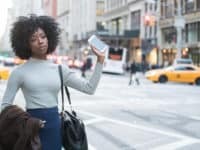 If you haven’t already used Uber, and are a first-time rider, your first ride with Uber can be free (up to a certain amount, depending on where you are located). All you need to do is enter a promo code (which you can find at uber.com), or have a friend refer you to Uber. Download the Uber app and create an account. For information on how to do this, see our tutorial on how to download and sign up for Uber. If you received a referral code from a friend, open that message and tap the link they sent you. You can also enter the code manually in the Uber app. Open the app, tap the menu button (the three horizontal bars), and then tap Promotions. Enter the code you were given, and then tap Apply. Once the code has been entered, you will automatically receive a predetermined amount off of your first Uber ride. 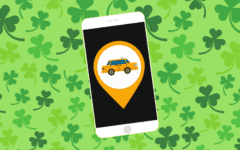 The amount can vary by city or promotion, but it is likely you will receive approximately a $20 credit off of your first ride. You cannot control which ride this promotion is used on, because it will always be the first ride you take, whether the ride totalled $20 or not. This means that if your ride was only $7, you will only receive a $7 credit. If your ride was $33 dollars, you will pay the additional $13 fee above your $20 credit. Remember this when taking your first ride, as it is advisable to wait to use it until you can benefit most from it (with a ride that costs at least $20). Having said that, a free ride is a free ride, so make sure you enter a promo code for your first Uber ride! Once you are signed up for Uber, you can consistently earn free rides by promoting Uber’s taxi service. 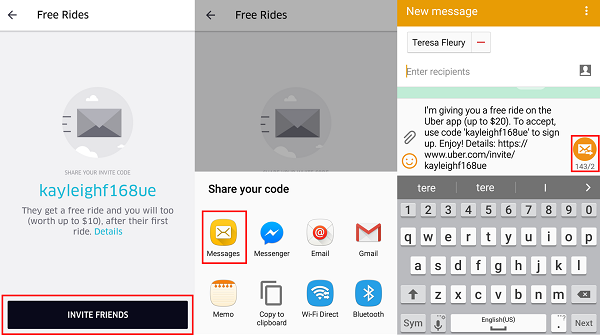 All you have to do is tell someone your personal Uber promo code, or send it to them through a variety of ways. When you open an Uber account, Uber automatically assigns you a promo code that you can view at any time by opening the app, tapping the menu button (the three bars), and then tapping Free Rides. When looking at your free ride promo code in the app, tap Invite Friends. Then choose a way to share your code from the options given to you by your device. Commonly used methods to share your code are by SMS text message, email, or other messaging apps. You can even utilize social media services such as Facebook or Snapchat to share your code! Tap one and follow the steps you would follow within that program to select a contact, and then send your message. When your contact enters the code, they will receive a credit off of their first ride. 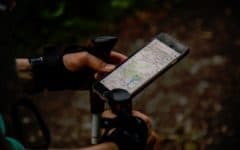 Once they have entered your code and actually taken their ride, a credit (amount varies by location) will automatically be applied to your account. You can view your free rides by tapping the menu button in your Uber app, and then tapping Payment. If you have any free credits, you will see them appear below your credit card or other payment options. Tap on it to see more details. You can also see your free rides by tapping the menu button (the three bars) and then tapping Promotions. If you have any free rides, they will appear, and let you know when they expire. This referral process is only intended for new Uber users, meaning a friend who already uses Uber cannot take advantage of your referral code. Uber may suspend your referral code privileges if you try to invite existing Uber users. Also, remember that these promotions also expire after three months, so use them within that time frame. Another fun trick you can use to save even more money is to refer Uber to a friend, and then ride with them when they take their first ride. For example, if you’re carpooling with a large group, it’s a great idea to send your promo code to someone who isn’t an Uber user; that way, when they take their first free ride, the whole groups gets to ride for free using Uber. Then after they have used their free ride, you will get another free ride later for sharing your code! 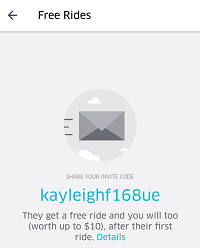 Occasionally, Uber may run a promotion that provides users with a promo code to give them credits off of their rides. Historically, this is exclusively for new Uber users, as existing users can always utilize the referral system to get free rides. However, it doesn’t hurt to always check! Try opening your web browser and visiting www.Uber.com to see if any promotions are currently running. If they are, they will likely appear on the home page banner. 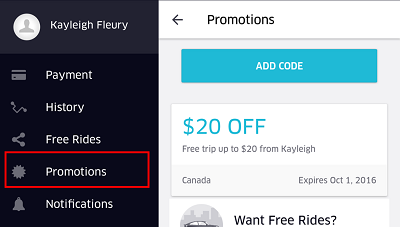 Or, you can try typing the phrase “Uber promo codes” into a search engine. 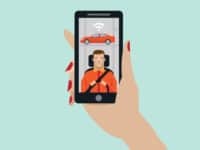 Though this method won’t get you a free ride, it can help you save some money on a ride you take with another passenger who uses Uber. Splitting the fare divides the Uber fare by the number of users who have agreed to split it. To split an Uber fare, first request an Uber driver. 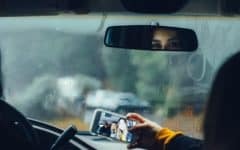 Once the driver is on the way, or at any time during the ride, you can tap your driver’s name or photo, and then tap Fare Split in your Uber app. Select friends from your contact list who are riding with you, and then tap Done. 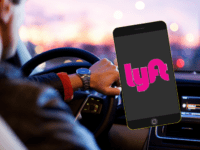 The co-rider will receive a notification on their device immediately, and then must tap Accept before your ride ends. If they do not accept the invitation before the ride ends, you will pay the full fare as normal. If they do accept, the fare will be split equally amongst those who have agreed to split the fare. Those are our tips and tricks for saving money using Uber, and utilizing Uber promo codes, discounts, and free rides. 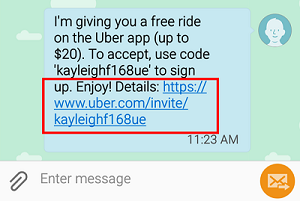 Remember to always send invitations to your contacts if you want free rides with Uber!